Whatever happened to this story? Back in December 2001, the media were abuzz with claims that “explorers… have discovered what they think are the ruins of a submerged city built thousands of years ago”. It was a big claim that got attention from respectable sources, such as National Geographic, as well as the more woo-woo crowd, such as Linda Moulton Howe of cattle mutilating aliens conspiracy fame. The news was greeted with delight by those who believe Atlantis to have been a real place rather than a political fable by Plato. More specifically, it appealed to those who, following the supposed psychic medium Edgar Cayce (1877–1945), believe Bimini in the Bahamas to be a part of the sunken island. What were the claims based on? In 2000, Paulina Zelitzki and Paul Weinzweig, owners of Advanced Digital Communications (a company that appears not to have a website), were one of four companies commissioned by the Cuban government to undertake sonar surveys off the Guanahacabibes Peninsula at the western tip of the island. Advanced Digital Communications had previously had success in locating the remains of the USS Maine, which sank under mysterious circumstances in Havana Harbour in 1898, during the Spanish-American war. It was hoped that they could locate further sunken ships. 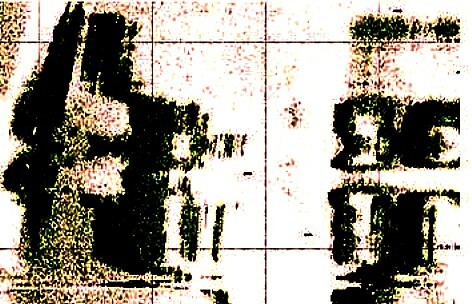 They were astonished to find in the survey off the Guanahacabibes Peninsula that some of the sonar images appeared to depict symmetrical features aligned to a grid. This prompted them to undertake a second survey, using a submersible robot. It was this second survey that returned data that seemed to show pyramids and other structures. Indeed, according to Paulina Zelitsky, the images suggested that the “city” was built from blocks of cut and polished granite. 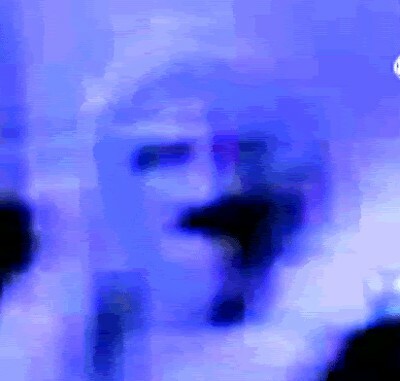 An analogue of the Face on Mars under the sea off Cuba? Here, at last, was something that seemed to be good physical evidence for the existence of an advanced civilisation at a time when sea levels were much lower (the inference being that this would have been during the Pleistocene Ice Age). Some of the claims repeated on the web included the identification of a sphinx, a structure resmbling Stonehenge and a monument identical to the “Face on Mars”. All of this is under 600-750 m (2000-2500 feet) of water, a very long way down indeed. It was so deep that it caused problems for the Advanced Digital Communications team, who could not explore the site in the detail needed to confirm their ideas. In order to get better data, Paulina Zelitsky began raising funds for a third expedition to the site. It was announced in October 2004, in a story that seems not to have been picked up by the world’s media (although various New Age and fringe type websites noted it), but “they could not complete the mission due to technical deficiencies of the submarine that rendered it unable to take images from the marine bottom”. One wonders why they went under-equipped when on the verge of so important a discovery. Nevertheless, Zelitsky announced that they would be returning in 2005, with funding from National Geographic Society. Since then, silence (apart from its inevitable appearance on Ancient Aliens). The depth of the alleged remains is the biggest problem of all: during the Pleistocene, sea levels dropped as water was locked up in the ice sheets that developed around the globe. At the maximum extent of the ice, the drop in level was around 100 m, which is very different from the 600-750 m depth of the alleged remains. At no point during the Ice Age would they have been above sea level unless, of course, the land on which they stand has sunk. This is the claim made for Atlantis: according to Plato’s account (the only primary source for it), it was destroyed σεισμῶν ἐξαισίων καὶ κατακλυσμῶν (“by violent earthquakes and floods”). However, if we take Plato at his word – as we must if we assume Atlantis to have been an historical place – the violence of its sinking makes it improbable that an entire city could have survived plunging more than 600 m into an abyss. Remember that this was μιᾶς ἡμέρας καὶ νυκτὸς χαλεπῆς (“in one fearful day and night”); also recall that διὸ καὶ νῦν ἄπορον καὶ ἀδιερεύνητον γέγονεν τοὐκεῖ πέλαγος͵ πηλοῦ κάρτα βραχέος ἐμποδὼν ὄντος͵ ὃν ἡ νῆσος ἱζομένη παρέσχετο (“and this is why the sea in that are is to this day impassable to navigation, which is hindered by mud just below the surface, the remains of the sunken island”). Rapid sinking would devastate structures; the persistence of mud just below the surface suggests that the sinking was not to a depth of 600-740 m. Unless we are prepared to jettison Plato’s text – the sole source for the story of Atlantis – we cannot identify the features found by Paulina Zelitsky with Atlantis. The next problem involves trying to understand what the sonar shows. 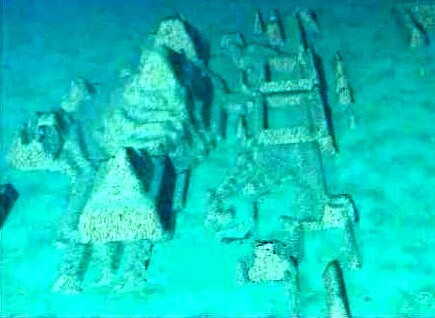 All the fancy graphics showing pyramid-like structures are computer generated: they are not photographs of things seen under the sea. All the detail is limited to the resolution of the side-scan sonar, which is not good enough to determine whether the supposed structures exhibit 90° angles, let alone confirm the claims that some stones are covered in hieroglyphs. The initial images, which do not have the three-dimensional data provided by the side-scanning sonar, show rectilinear but not rigorously right-angled features, so I suspect that the angularity of the generated images is an artefact of the processing, much like many of the details claimed for the ‘Face on Mars’. We have some interesting sonar images that are basically like ink-blot tests: they need interpreting and the interpretation is entirely dependent upon the preconceptions an biases of those looking at them. Paulina Zeltisky was predisposed to see artificiality, because that is what she was being paid to do (even if the artificiality she was specifically interested in involved sunken ships). Others have seen geological formations. So, what happened to the story? Although some conspiracy theorists have suggested that either Paulina Zelitsky’s findings from 2004 or 2005 were suppressed by Teh Military or she was prevented from returning to the site, again by Teh Military, in reality, the story simply went cold. Despite initial enthusiasm in some quarters, including from the Cuban marine geologist Manuel Iturralde-Vinent, experts were not convinced that Paulina Zelitsky had really discovered a sunken city. Zelitsky continues to work as an oceanographic engineer based in Ontario (Canada) and has not announced any plans since 2004 to return to the site. Although some may see this as evidence that she has been warned off it, it is more likely that she has been unable to persuade anyone to finance an expedition in search of something that in all likelihood doesn’t exist. The story was given a new lease of life thanks to its exposure in Ancient Aliens, but no new information about it has emerged. After the initial flurry of excitement, once scientists began to look critically at the data, especially the sonar images, the story could be seen to be nothing more than hype. For anyone outside the small band of “alternative researchers” and New Age true believers, the story simply died for lack of evidence. But when did a lack of evidence ever stop woo-woos making unsupported claims? I generally believe Thera to be the basis for Atlantis, with Plato having taken some artistic liberty. Unfortunately Thera doesn’t really fit the “Atlantis story”. For one, Thera is still there, and housing structures have been excavated. Atlantis was supposed to have “sunk beneath the waves”. For another, Thera is not near “The Pillars of Hercules”, and the nearest major civilization (Knossos) is also still there…intact. Although I agree with you, in the original story of Atlantis by Plato he is quite clear that nothing remained of that island…and yet, Santorini exists; hence, this is not Atlantis. but islands don’t sink, water levels can rise though. The perspective is entrapping the listener. This is incorrect. Islands can sink. Not saying this one did , but I am saying land masses can and do sink. I think that the whole earth was civilized and very advanced. Some called it the Garden of Eve some called it Atlantis. The ruins we are finding are evidence. There were 4 rivers and one sea, often referred to as the crystal sea in the North. Oceans came after the flood. Don’t you mean the Garden of Eden? It is only evidence for those who want the evidence to fit into their preconceived notions. No amount of evidence to the contrary will persuade you, which is the difference between someone who gets science, and someone who doesn’t. The garden of Eden is a story for idiots. How does what you think have any bearing on this story? 2500 feet or so is about the same depth as the Titanic; certainly the technology is available to send an unmanned or even a manned submersible to the area to chack things out…I’m surprised Ballard and the other scientists at WHOI or even James Cameron (who went down to see the Titanic for himself) have not pursued this…comments? You might want to re google the depth of the wreck of the Titanic. It’s much deeper than that. Your points stands though. This is, as the article implies, clearly tosh of the highest order. I suspect that it could be because whatever Zalitsky found was not the remains of a civilization. What would be the outcome if Zalitsky had stumbled on the remains of nuclear weapons that were dumped there after the Cuba Missile Crisis? The Cubans, Russians and Americans may want that to remain quiet :-). Cuba, to say the least, is still a politically unstable area. Getting permits and authorisations must be quite an administrative maze. So it is not surprising that findings are filtered before being published. After all, scientists are always very dependent on public fund for their research. Have a look at these coordinates in Google map: 31.332525,-24.32373 and you will find unexpected right angle lines. Another look at 34.338351,108.569748 in google map will show another thing the government of a country is trying to keep hidden. What is hiding at 34.338351,108.569748? There’s nothing hiding. It’s a Chinese pyramid. I did some forestry research in Guanahacabibes in 2001, and getting the permits etc. was not much of a chore. You need an invitation from a Cuban organisation, and they are generally not that closed off as you might think: I met several people from Europe and from South America, for example studying bats or just visiting to exchange ideas about nature reserve management. I am not familiar with marine archaeology, but in many other fields Cubans keep in touch with international organisations, Unesco, IUCN et al. It might be different now, but they were after all planning to go back in 2004 originally, when the political situation was much the same as in 2001. Too bad the story died. We don’t know much of ourselves and the underwater city offeers us great opportunities to explore. Is it Atlantis or not? Why do we have to jump into any conclusion too early too soon? But it would be amazing to further explore it… Maybe they can even get some tourists under water to experience it. That would be soo cool. Noticing that all human cities and dwellings have always been erected near water, I strongly suspect that many important traces of any previous civilisation will be found by those who dare search where the waterline was just before the holocene epoch started, some 12,000 years ago. This would also be good to explain 2 things: the fact that cataclysmic inundation occured all over the globe a long time ago, and the fact that we find no traces of a civilization prior to 5,000 BC. Ocean level has changed by as much as 400 feet, 120m since the last glaciation. It is quite high for me but there is over 3Km of ice on top of the antartic continent!. Groenland does have aa good share of a ice cap too, even though it seem to be melting at an alarming rate. https://polldaddy.com/js/rating/rating.jsThey do, in fact, find all kinds of archeological stuff in shallow water off modern coasts, and even Doggerland. What they don’t find is non-existent magic cities at depth that haven’t been above water for millions of years, that would be crushed by water pressure if anyone attempted to build anything under water for no worthwhile reason. if one can be seen at 34.338351,108.569748 in GOOGLE, there is anoter one right next to it, at 34.340327,108.562045, some 500m to the west. By the way, the big pyramid seem to have the same base surface as the pyramid of Kheops. Also, their alignment with the geographic North if off by about 10 degrees. Can that 10 degrees be translated into 27,000 years? It is not a bad article, but firstly: I would like to see the proof of statements you make (statement: story could be seen to be nothing more than hype – by whom? where?Claim made – by whom?where is proof?) Secondly structure-vice: this is case of bad archeology and you are trying to disproof scans and photos by legends??? Thirdly: if this side-scan sonar scans look like geological formations, than I am President of USA… If you stay more factual in your work and unattached you could do much better. Yes I do understand that you aim to entertain, but do it scientifically and you’ll shine! Historians and archeologists have been well known to twist the truth according to their sponsors’s interests! That is simply not science. At best it is obscurantism. It would be nice to see scientists of all disciplines freed from public funding. What would then become public knowledge? How fast would public well being and in which direction it would evolve? Findings like the one west of Cuba would have triggered other research expeditions. But for now, we are as much in the dark as if nothing was ever found. Scientists exist today because others around them take care of their well being, allowing them to invest much more of the larger free time they can dispose of in science than average people can do. Therefore, I state that every scientific discovery must belong to humanity, not just a man or a country! Paulina Zelitzki tells real truth finally! The problem with your article now? Thinking of writing another one on the website: Greatest Archeology discoveries of the century? LOL. Well it will teach you to do your research properly and shows to everyone how easy it is to drop the bucket of mud on anyone… All the best in your career. The talking head video presents no new evidence, is promotion for Paulina Zelitsky’s memoirs and tells us nothing. LOL. Well, have you read the the Paulina memoirs? After All her memoirs are on the subject of this article. If you are going to become a good author, PLEASE do your research BEFORE you publish your article or work. For goodness sake, we are living in the modern world it is easy to contact ANYONE on Facebook and ask any questions! In my defence, I wrote this piece before she had published her memoirs. How could I have read them in advance? Have you read them? I understand that, but you could always contact people. Writing article, even in a comfort of you room is not an easy task. But preparation of materials and facts for publishing is really hard work and this is what separate amature from pro. I am sure you know what I mean. In the field of disproof and debunking there is always a risk for making a mistake because of the author pre-set mind. Keeping your mind open during investigation would help.Let facts than to make up your mind, not emotions. Please read her memoirs it will open your eyes. Put it this way – it would definitely make you to change your article. All the best to you in your challenging endeavors of debunking frauds! I am a history professor from Puerto Rico studying those findings for more than ten years. I’ve seen the sonar readings and the sub’s photos. There are pictograms over the stone megalits resembling a mix of celtic and mayan writings. The submersion is not due to global warming but by tectonic failure. Remember there is a big fault at the Puerto Rico trench, the deepest part of the Atlantic Ocean at 19.5° latitude (hyperdimensional physics) which also hapens to be the location for the greatest gravitational anomaly in the world. 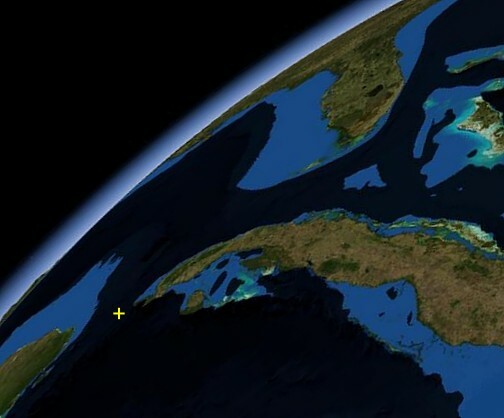 The Cuban government was not interested in the findings because they were afraid it will interfere with their sea oil extraction proyect by the potential declaration by the UNO of the site as a world archeological treasure. But Dr. Manuel Iturride, if I am not getting his name wrong, Director of the National History Museum acknowledged the findings and was working along Zelitsky. National Geographic didn’t had an agreement with Paulina because they wanted exclusivity. She was running out of funds and they needed an appropiate deep exploration sub and equipment. Agustin, where are the pictures? Can you published them? Pingback: Emerald Tablets Of Thoth, 50,000 Year Old Tablets Reportedly From Atlantis | 2012: What's the 'real' truth? What about 23000 yrs old Dwarka also found underwater? Dwarka (better known to Graham Hancock’s readership as the Bay of Cambay) is a controversial site. Nevertheless, even if some of the data are accepted as being of archaeological rather than natural origin (which is a very big IF! ), the dates are nowehre near as old as you claim. The only dated material—a piece of wood with no known archaeological provenance, as it was dredged from the seabed—has returned dates in the eighth millennium BC, which is nowhere near as old as your unsubstatiated claim of 23,000 years! What about this new stuff? It’s amazing how badly people want to believe, and how much they are willing to forgo a reasonable, objective approach because of it. This story would not remain cold and in the obscure corners of the internet if indeed there was any chance of it being true…. People of strong faith, no matter they place it in, are impossible to debate with; however, you have done an admirable job. As for the age of a finding, archeologists, egyptologists and historian always align their finding with their sponsors’s agenda. Ask Virginia Steen-McIntyre about her findings at hueyatlaco in 1962-1964-1966 and she will tell you that you cannot come forward with 250,000 years for the age of a site and think for a minute you will keep your job! The fact that several geologists and several digs have shown her right seems to be beside the point. Come to think of it, religions are really the opium of Peoples! Forced Vaccination, MIND CONTROL and the Corrupt Jesuit Catholic New World Order with their secret tunnels filled with GOLD from the last 1500 years have the most to lose. It also gives them time to destroy the evidence with Military Submarines. Look up Alan Smith Vitamin-C 60 Minutes Swine Flu on YouTube and it starts to form a bigger picture of MIND-CONTROL…. It would be nice if this were plausible, but it is not. The city of Moroni ?!? Pingback: Is the Sunken City of Cuba, Atlantis? Officials Ignored it for 10 Years Because it’s ‘Out of Time and Out of Place’ | Earth. We are one. There seem to be an agreement among scientists to the effect that sea water level has risen by about 400 feet (120m) at the end of the last ice age. Also, paleoclimatologists and geologists are of the opinion that the Earth’s climate changed abruptly in 10,000BC. The resolution of the date is +/- 1 to 3 years when trying to mesure an event so old. It is understood the catastrophic changes took place within this 1 to 3 years uncertainty period. The interesting point is this: If a major climate/water level change occured within a 3 years time frame, this can definitely be taken as “end of the world” class event. It must be noted that, regarding this period of major change, nothing prevent one to think it occured within much less tan a year. There will never be any proper exploration or documentation of these ancient sites because the “community” has their narrative (civilization is less than 10,000 years old) and won’t allow any challenges. Why are they so afraid of the idea we’ve been around and organized not just 10,000 years, but 10s of thousands of years? Whose applecarts are upset by this? Are people forgetting that Plato got his story from Solon when he was a kid, an information given to Solon upon a visit in Egypt????=???`??? Thus anything Plato says is speculation and inflation, not to be trusted at all… so why give this Myth such focus..
We don’t know that Plato wasn’t making this “authority” up! Effectively, the fact that there is a so weak witness should raise questions about the authenticity of the Plato history. This does not explain why there is so much interest for such a myth. https://polldaddy.com/js/rating/rating.jsI didn’t look and I found no convincing evidence.